Kettering indie psych quartet Temples have announced details of a UK tour to support the release of their forthcoming new album. 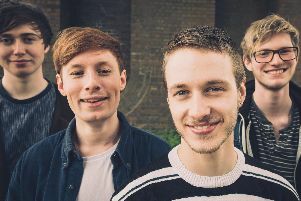 The band, featuring James Bagshaw, Thomas Walmsley, Adam Smith and Samuel Toms, kick off their six date jaunt across the country on March 26 in Newcastle. The tour heads to the Midlands when they headline the O2 Institute 2 in Birmingham on April 2 before Temples spend the rest of the month touring across Europe. Ahead of their UK shows, Temples are playing a run of dates in California, Arizona and Texas as part of the Desert Daze Caravan Tour with Night Beats, Deap Vally, Froth and JJUUJJUU. Temples release new LP Volcano at the start of March. The record follows 2014’s debut Sun Structures. Volcano is available to pre-order now on vinyl, CD and digital formats. New single Strange Or Be Forgotten was recently chosen as Beats 1’s World Record.